Most 21st-century Internet users know that writing in all caps implies a manner of visual shouting–we learned this e-etiquette rule back in the last century. I’ve noticed a return to block letters in some hipsters’ status updates on Facebook, and because of the silly nature of their observations on mundane life, I assume this trend indicates irony and therefore elevates said hipsters’ intelligence among like-minded peers. And I will admit, sometimes the all-caps updates are amusing. But what I’m thinking about now is how tv commercials are changing their tactics as a result of TiVo and U-verse. This morning I turned on CNN to catch up on the news, but after three minutes of listening to a debate over the issue of a voter having to present a government-issued ID in order to vote, the network took a commercial break, and so I paused the stream. The image above, F-L-Y, stayed on the screen while I went to the kitchen to put the kettle on and let the dogs in from their morning romp in the yard. FLY stayed on the flat, wide, 3-D, plasma screen while I spooned up my granola, sipped my coffee, and glanced at the piles of books on the table. Usually, when I pause the tv I lose interest in any further information CNN might offer, and eventually I turn off the set and continue my day. But lately, images that remain frozen on the screen have piqued my interest in ways the advertisers may or may not have considered. In the case of FLY, I thought perhaps the designers took into account how they now need to shout at the consumers, since many of us now have the capability of fast forwarding through the commercials. The hope is that some subliminal desire will remain with the viewer and therefore be associated with their product in the future. 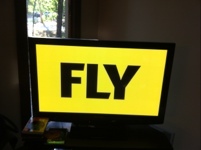 If I am at all aware of the product FLY is promoting, I can’t retrieve the thought in my conscious mind. Another option I have is to believe in the synchronous properties of the universe, and how thoughts converge in place and time in meaningful ways. I can assign the meaning I choose, even if the advertisers had no conscious intention of communicating whatever significance I give the image. In this way, I have created something new with the tv screen. I have turned the screen into a temporary holding place for art. Even the size and shape of the screen implies the shape of a medium-sized painting. My piece is titled SHOUT.